Growing up, sisters Anna and Elsa (voiced by Kristen Bell and Idina Menzel) were inseparable, however, when Elsa’s ability to conjure snow and ice starts to grow out of control, Elsa resorts to seclusion to keep her loved ones safe. 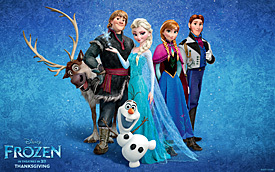 With Arendelle buried in wintry elements right in the middle of Summer, it’s up to Anna, a mountain man named Kristoff (Jonathan Groff), his reindeer Sven and Olaf (Josh Gad), a living, breathing snowman with a thing for warm hugs, to track down Elsa and thaw the kingdom once and for all. It’s great to put your assets to good use, but if you want your film to offer an entire package, other elements need to be considered. In the case of Burlesque, writer-director Steve Antin has Christina Aguilera on the brain and nothing more. Clearly this tunnel vision works well when it come to vocals, but just about every other component is practically ignored. As good as her voice is, if you don’t have the proper camerawork to capture the action, adequate editing to make the visuals comprehensible or a well-developed story to engage viewers, you might as well have just made a CD, not a feature film. Burlesque stars Aguilera as Ali, a small-town waitress who’s fed up with her minimal existence and craves the spotlight. She follows her dreams straight to Los Angeles, but quickly learns that a city change doesn’t mean instant success. After a number of failed auditions, Ali comes across The Burlesque, a nightclub with “The best views on the Sunset Strip.” The place is owned and run by Tess (Cher) with the help of her ex-husband Vince (Peter Gallagher) and loyal assistant Sean (Stanley Tucci). A barrage of girls hit the stage each night to wow the crowd with dance and lip-synching routines. Unfortunately, even there, a job doesn’t come easy. 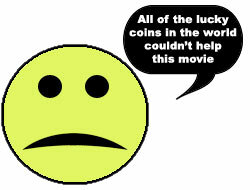 After being rejected by Tess, Ali takes it upon herself to go to work for the bartender, Jack (Cam Gigandet). Their relationship goes from business to personal when her apartment is ransacked and she’s forced to bunk down at his place. The only thing stifling this budding romance is Jack’s fiancée who happens to be out of town for a few months. As things heat up at home, they heat up at work, too. Ali finally gets her chance to audition to dance on stage and makes the cut. When a music malfunction mutes the vocals, Ali takes it upon herself to sing the tune and blows away not only the audience, but Tess as well. It was no surprise that after Forgetting Sarah Marshall, Kristen Bell opted to stick with romantic comedies. She wasn’t the film’s prime comedic relief, but her performance proved that she’s got the chops not only to provide a good laugh, but to create a genuine character as well. The problem is, by sticking with the genre, she wound up with junk like Couples Retreat and today’s new DVD/Blu-ray release, When in Rome. Couples Retreat was one thing; she got the opportunity to star alongside Jason Bateman, Vince Vaughn, Jon Favreau, Malin Akerman, Kristin Davis and Faizon Love. If she was looking to network, to sign on for a guaranteed hit or just get some face time alongside a talented bunch, this was it. What was her excuse when it came to When in Rome? Okay, Josh Duhamel is quite good looking, but surprisingly, that’s not all that counts when it comes to romance. Katherine Heigl and Jennifer Aniston might be stuck playing the same lady in a relationship crisis for the rest of their careers, but Bell is not. The talent is there, she’s just got to find better reasons to put it to use. She needs to leave the formulaic romcoms to those doomed to the genre’s dredges for eternity, and move on to something she can make memorable. There’s no harm in staying in the land of love, but at least test the waters and explore the vast amount of more unconventional relationships out there. Why not give one of these a shot?